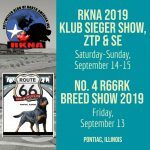 Rottweiler Health Awards › Rottweiler Klub of North America Inc.
RKNA has developed a program to educate and encourage our members and supporters to strive to better the breed through health testing prior to breeding. To achieve this we have 4 levels of “RKNA Health Tested Certification” awards available for individual dogs. Members are encouraged to apply for an award certificate upon obtaining passing results. It is strongly encouraged that all members receive a ZTP or Standard Evaluation on their dogs when breeding is considered. To apply for Health Awards contact the Breed Warden by email with the following information. Proof of passing Health Clearances from the following organizations ADRK, FCI or OFA.